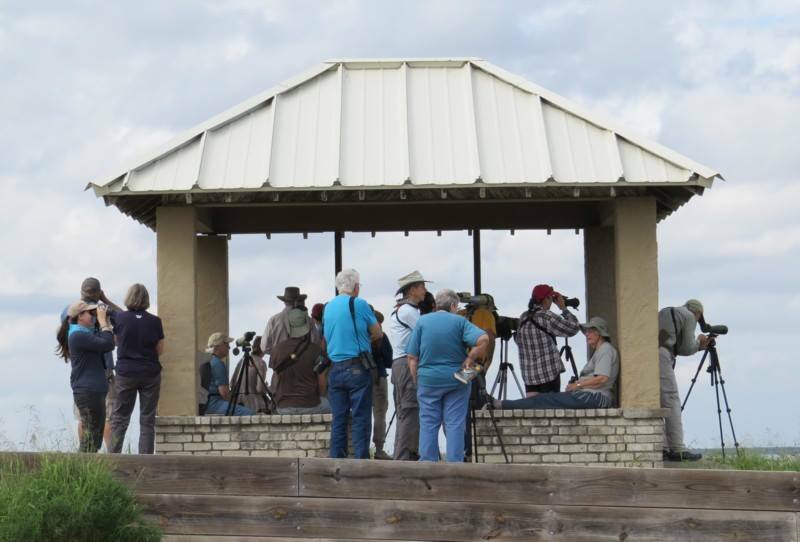 Once a month, Mary Beth Stowe hosts a field trip to an interesting, birdy area somewhere in the Rio Grande Valley. 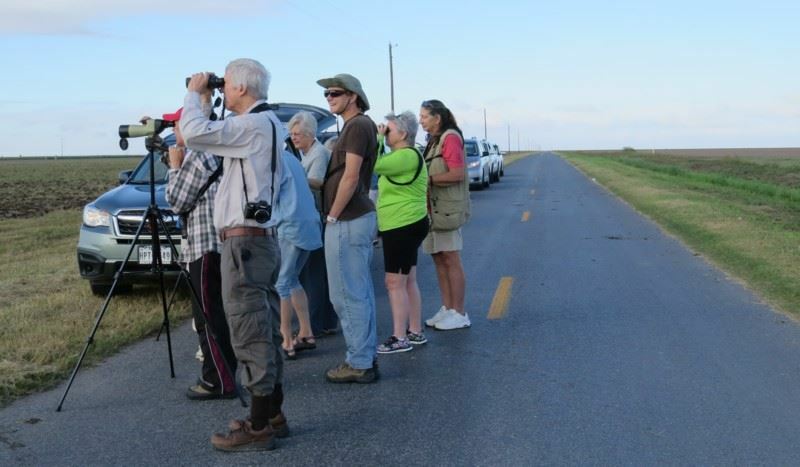 Yesterday, we had six vehicles of birders that took to the back roads northeast of Harlingen in search of Mountain Plover. On the way to this area, we passed a small lake with about a 1,000 (probably more) Black-bellied Whistling Ducks. The photos in this post were taken by Mary Beth. Thanks Mary Beth for your permission to use these photos. We did find some Mountain Plovers out in the fields. Unfortunately, they were too distant for photos. In addition, there were Savannah and Vesper Sparrows. Horned Larks. 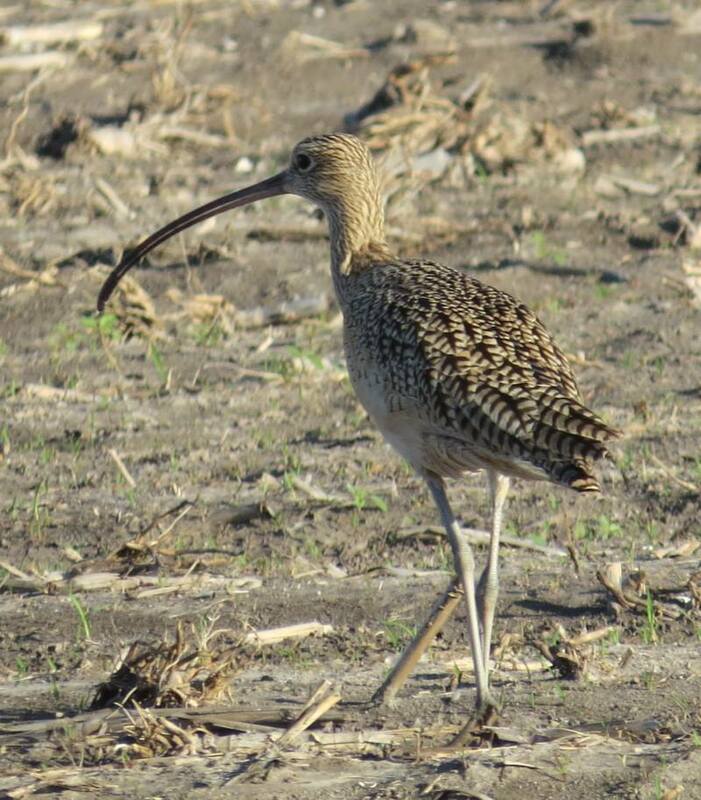 Long-billed Curlews. Huge flocks of Red-winged Blackbirds. Many Great-tailed Grackles. Lots and lots of Killdeer. Some farmers were plowing in one field. This activity drew in numerous Crested Caracara, American Kestrel, vultures, a Northern Harrier, at least one Red-tailed Hawk and lots (10 at least) White-tailed Hawks. 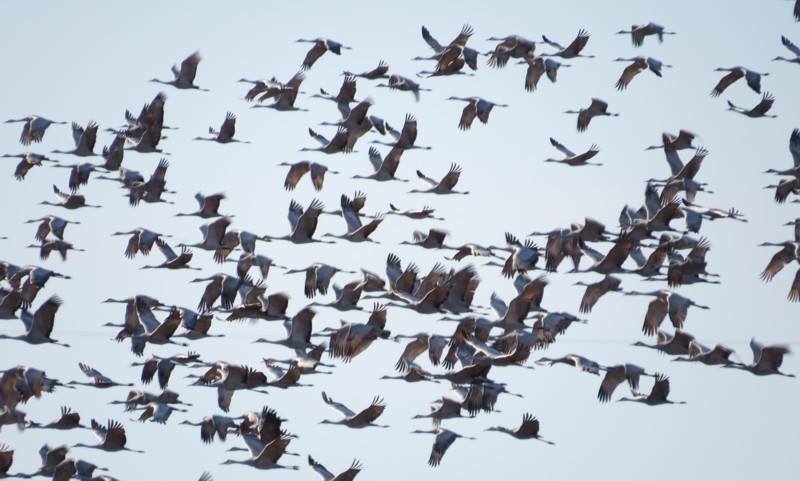 Also in the backroads we were checking out, there were big flocks (thousands) of Sandhill Cranes, and smaller flocks of Snow Geese and Greater White-fronted Geese. The area is very dry this year. Places that were “under water” last year are now green and dry. We did find one small pond near one farm. Here we saw Ladder-backed Woodpecker, Vermillion Flycatcher, Great Blue Heron, Mourning Dove, Golden-fronted Woodpecker, Great Kiskadee, Loggerhead Shrike and Northern Mockingbird. Then we snaked our way out to the Laguna Atascosa National Wildlife Area. I use the word “snaked” because there are several detours in that area due to road work that has been on-going for several years (extremely slow going on this). And the approach road to the Wildlife Area is totally covered with potholes. I have been coming here for 4 years, and this road just keeps getting worse and worse. There is evidently some kind of conflict over which branch of government is responsible for the road and they can’t come to together to get the road repaired. Cars traveling along here sweep back and forth as they try to drive around the holes and ruts. Fortunately, there is little traffic (understandable) so this allows for driving all over the road as you pick your way along. The target birds at Laguna Atascosa, were Eurasian Wigeon and Tropical Parula. They both have been present for the past several weeks. We drove to Pelican Lake in the refuge to look for the wigeon. This a LARGE lake. There were over 10,000 (maybe twice that number) waterfowl on the lake. Finding the Eurasian Wigeon was quite a task. However, one member of the group located it and most of the group was able to view the bird. On Pelican Lake there were American Wigeon, Blue-winged Teal, Northern Shoveler, Northern Pintail, Canvasback, Redhead, Ruddy Duck, scaup (probably Lesser), White Pelican, American Coot, Pied-billed Grebe, Double-crested Cormorants, Great Blue Heron, Great and Snowy Egret, Little Blue Heron, Tri-coloured Heron, White-faced Ibis and Osprey. Several alligators were seen drifting along the surface, also. Along the trails and feeding area, we noted Scissor-tailed Flycatcher, Green Jay, Tropical Kingbird and White-eyed Vireo. As we were leaving the refuge, I was watching for Road-runner, as I have seen them along here in the past. But that was not the case yesterday. 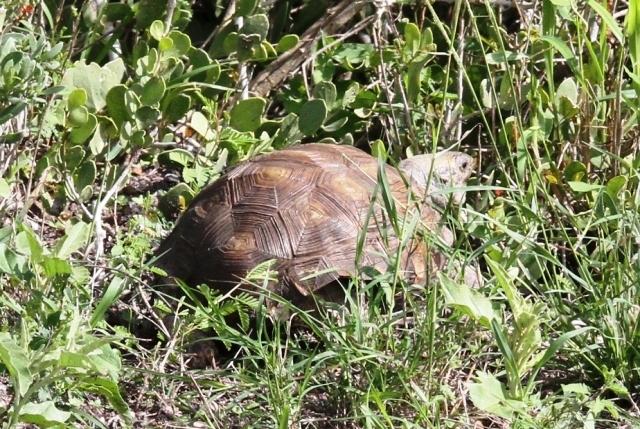 However, I did manage to spot a Texas Tortoise as it was heading back into the brush and an immature Harris’s Hawk perched on a utility pole and took these pictures. Even though I love going off on my own in search birds, and birdy areas, I also enjoy these group endeavors. There is good camaraderie and always lots of laughs and just a general good time. 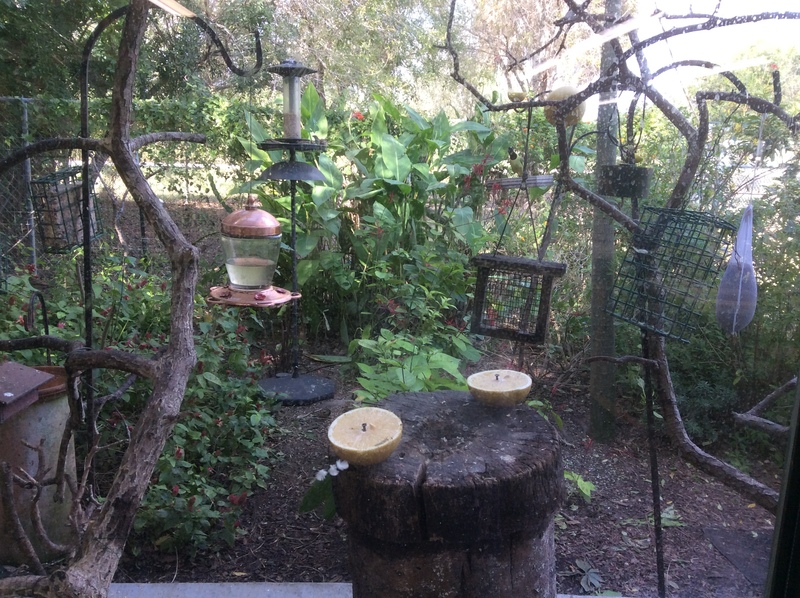 This is a picture of our Bird and Butterfly Garden located right behind the library. The first time an Amazon Kingfisher was seen in the states was in January 2010. It was found by Alan Wormington, in Laredo, Texas, along Zacate Creek. The bird continued to be seen for weeks. The second time an Amazon Kingfisher was seen in the states was in November 2013. It was found by Jeff Bouton near a resaca (small lake), east of the intersection of Highway 100 and Highway 77, just south of Harlingen, Texas. The third time an Amazon Kingfisher was seen in the states was late in October of this year. It was found by Raul de Laredo (Raul Delgado) in the exact same location where the first one was found back in 2010. All three of these sightings were of female individuals. This morning, I got up early. Made a coffee and headed out for Laredo. It is about a 3 1/2 hour drive from our place in San Benito. I located Zacate Creek and scouted the area. It wasn’t long and I found a Green Kingfisher. About 45 minutes later, I saw the Amazon Kingfisher. Then the Green Kingfisher showed up again. As I was leaving, I ran into a couple of other birders that were looking for the bird. I showed them the area where I had seen it. We continued to search. We saw a found a Ringed Kingfisher and then a little further downstream, we re-located the Amazon. This is the book I used to help identify and learn about Hawks. I bought it back in the early 1980’s. It was written and compiled by Bill Clark and Brian Wheeler. Shortly after acquiring the book, I was birding at Whitefish Point in the upper peninsula of Michigan. Much to my surprise, I ran into Bill Clark that weekend in Whitefish Point. He was banding hawks there during spring migration. Of course, I had him sign my field guide. After I started spending my winters in the Rio Grande Valley, I learned that Bill Clark had been a resident here in Harligen for the past 14 years. And last year I went on a field trip with the Arroyo Colorado Audubon Society (ACAS–the Harligen group) that was led by Bill Clark. I brought along my hawk field guide and had Bill sign it, again (after all those years). Well, yesterday, Bill Clark led another hawk banding field trip here in the valley. Bill had located an area where a large field of sugar cane had been harvested the day before. Hawks and vultures ascend on recently cleared fields to feast on the carcasses of mice and rats, victims of the harvesting. And we saw numerous vultures, White-tailed Hawks and Swainson’s Hawks as we arrived. Bill and his two helpers were in the field setting out traps. 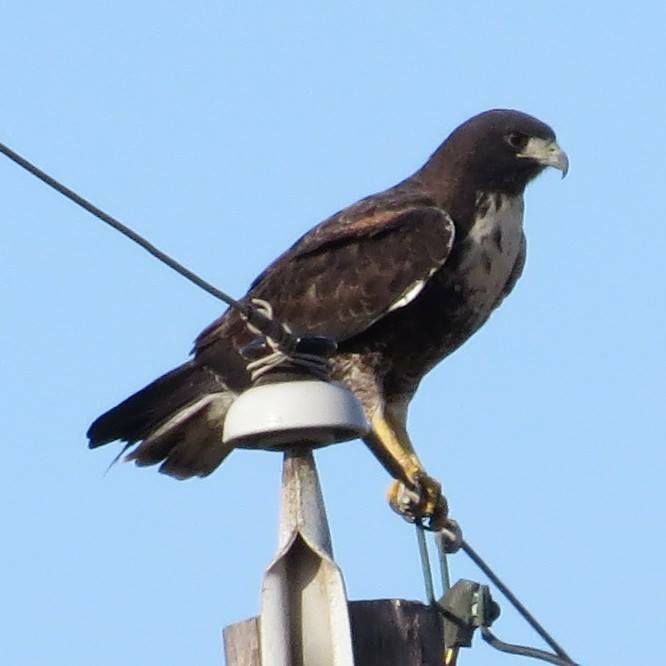 Bill had already captured a couple of White-tailed Hawks. 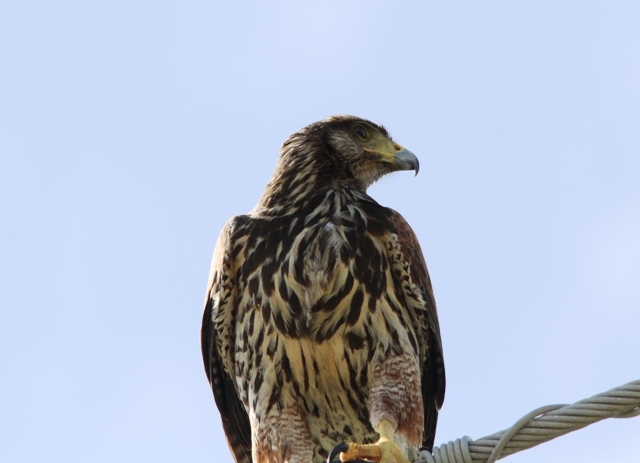 The Rio Grande Valley is about the only area in the United States where this hawk specie can be found. Bill banded these hawks as we watched. He spoke about the hawks as he worked. His helpers returned periodically with additional trapped hawks. In addition to the White-tailed Hawks, they brought an American Kestrel. On one of their trips out into the field, they located an Indigo Snake and returned with it to show us. Everyone in attendance on this trip had a great time. Bill Clark is a master.